Water is so much a part of our lives and here in the Ludington area, there's plenty of it! We are blessed to have Lake Michigan, Hamlin Lake, and the Pere Marquette River right outside our doorstep, allowing us to enjoy the great outdoors all year long. There's no more thrilling way to tour Hamlin Lake than on a personal watercraft. Hamlin Lake Jet Ski at (231) 843-2090, rents brand new three-seater Yamahas from a half hour to all day. 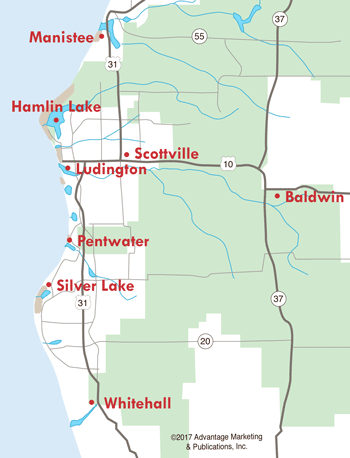 Ludington Water Sports (located at Sauble Resort), (231) 843-8497, also rents jet skis. Whether you rent a jet ski for one person or the whole family, the excitement of cruising the lake will be remembered as one of your favorite adventures. 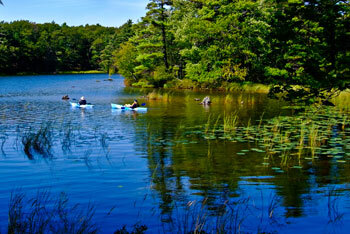 Many resorts along Hamlin Lake rent watercraft for your enjoyment. From comfortable pontoons to speed boats and fishing boats...rentals are available for an hour, half day or full day. Click here for Hamlin Lake boat & motor rental information. Hamlin Lake Concessions within the Ludington State Park (231) 843-1888 or Sunset Bluff Resort (231) 845-5002 on Upper Hamlin Lake. A highlight of your vacation--or a favorite pleasure if you have a summer cottage or year round residence on Hamlin Lake--has to be taking a leisurely sunset cruise around the lake. 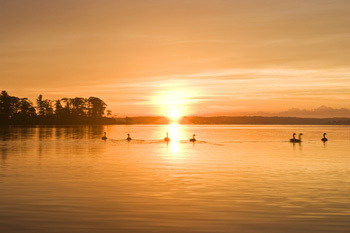 Whether you own a boat, or rent a boat from one of the marinas on Hamlin Lake, there's no finer way to end your day! Don't miss the thrill of charter fishing on Lake Michigan. There's nothing like being out all day on the lake with the wind at your back and the warm sun on your face. You'll feel a relaxed kind of exhilaration as you pull into port with your catch. Your charter captain will take you out on the big lake for half day or full day. Boats are licensed and equipped with the latest in safety equipment. Click here for local Lake Michigan charter fishing captains. The Pere Marquette River is known for fantastic trout fishing, as well as canoeing and kayaking. Businesses such as Baldwin Canoe Rental and Pere Marquette Expeditions rent kayaks, canoes, and tubes for those who enjoy exploring this 66 mile long scenic river. For further details, see www.VisitPereMarquetteRiver.com. Our wonderful lakes and rivers cool us down and provide hours of entertainment. The Ludington and Hamlin Lake area truly is a water wonderland.